Lighting is a must-have on all emergency supplies lists. Whether to walk around in the dark, prepare dinner, knit, read a book, or wash up before bed a Beam n Read provides personal light for a wide variety of daily tasks that need to get done when power is out. With significantly longer battery runtime than other lights, Beam n Read lights are still shining when other lights have gone dim. A Beam n Read works great as a hands-free light to illuminate personal space during power outages and provide hands-free task lighting. No need to sit near a candle or lantern with dim light on your work area. You can have bright light to work or walk anywhere. Beam n Read Lights have longer battery runtime than most other personal lights. This can be important during outages lasting several days or longer. Runtime with standard alkaline batteries is 100 continuous hours* when using 3 LEDs and over 50 hours* when using 6 LEDs. Even longer during normal intermittent use. Many bright flashlights don't even last 10 hours. Beam n Read lights use AA batteries which are the most commonly available batteries. You can even run it off a car battery with the optional USB Power Kit. Beam n Read Hands-Free Lights perform nicely for both mobility and task lighting. 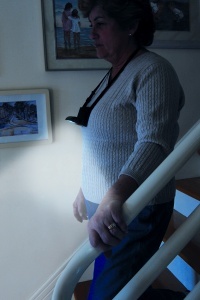 They are uniquely useful for seniors and the disabled who need a hands free, steady light when moving about in the dark using a cane, walker, or wheelchair or just needing hands free for stability. With its flat base it can be used as a mini table lamp. Just set the light on a kitchen counter bouncing light off the wall to give light for eating meals or on a bathroom counter for washing up. It will even sit on a pedestal sink for those with old houses and small bathrooms with no counters. The snap-on red relaxation filters included with models BNR LED 3F and BNR LED 6-3F help avoid night blindness when switching between light & dark conditions. Beam n Read Lights are very versatile and can be used anywhere for a wide range of other uses including: Every Day Tasks, Needlework & Crafts, Reading & Writing, Travel & Camping, for Caregiving to children or adults, and for Seniors & Special Needs. With a unique combination of features, accessories, versatility, and battery runtime, our patented lights are unmatched by other portable, personal lights. Included accessories vary by model. *Battery runtime measured per the ANSI/NEMA FL-1 Standard. Note that many headlamp and clip-on light companies measure to dimmer criteria to claim longer runtimes than their lights would measure per the FL-1 Standard. Emergency evacuation is ordered! Your sewing machine, pressing and cutting tools, and fabrics for a current project are already in your car. What 5 other items from your quilt room do you take with you? I purchased one of these at least 15 years ago. I originally purchased it so I could see my knitting of dark yarns better but have pulled it out everytime the lights go out, my family fights me for it but I won't give it up! It's better than any flashlight out there. My original one finally died today... I can't tell you how happy I was that it's still being manufactured. I guess good products stand the test of time. We recently had a two day power out storm here and, once again, my Beam N Read saved the day.